Listed below are our nominees for Top Blog of 2010. This is our final list and no other submissions can be accepted at this time. (Keep them for next year!) Nominees need to post our button on their site, and start gathering voters! Start your engines! Round one begins Nov. 20th. The bottom five blogs will be eliminated (depending on votes). Feel free to check out the entire list and find your favorite! Round One of voting begins this Saturday! For a complete guide to rules and regs click here. Thank you for this opportunity! I wish everyone luck! Very exciting! Good luck all!! I'm so happy to be listed here with such great blogs. I've been having a good time reading them. wow. am delighted with this news!! i'm honored to have made the list! please tell me what i need to do next. xo. This is such a wonderful honor. Thank you so much! I'm flattered. Thanks for the opportunity! Best wishes to everyone! Wow! how fun! I have no idea who nominated me but just to be on this list is DELIGHTFUL! Seriously? I'm so excited. I had no idea who nominated me -- thank you so much! Now to check out some of these other blogs! Wooowhoooo! how fun! 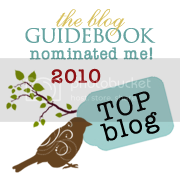 I never received the button to put on my nominated blog... how do I get that?! OH my goodness!! This is fantastic, what a wonderful surprise. This may sound cheeky but it truly IS an honor just to be nominated! * I suppose I should have included my e-mail address with my question! I am so very thankful. I love the blogging community and what you are doing to connect all of us.... it is wonderful!I will have to come say hi to all of you.... Yay. Let the fun begin! i just spent a little while hopping around and visiting all of the nominees...WOW great company. i am even more thrilled to be nominated!! I just discovered this nomination for Lune - Thank you so much. It's very rewarding just to think someone thought us good enough to be considered a 'best blog'. Really made my day! 500 members, man I need to get busy, I only have 298!!! Sorry to have missed this. I'd love to be part of this next year. Congrats to all the nominees!